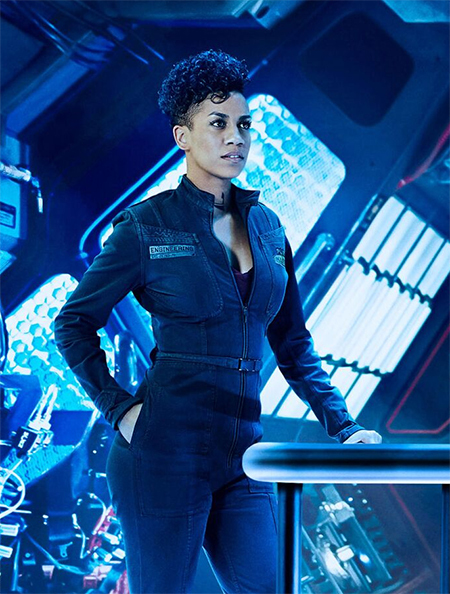 2017 saw Dominique Tipper’s return for a second season as the lead role of Naomi Nagata in Syfy’s flagship and critically-acclaimed series The Expanse, based on the popular science fiction series by James S. A. Corey. Set in the future, The Expanse tells the story of a detective, a first officer and a United Nations executive as they uncover a conspiracy that spans the solar system, and could threaten the future of the human race. In 2016, Tipper featured in Warner Bros highly anticipated Fantastic Beasts and Where To Find Them, as well as The Girl With All The Gifts with Gemma Arterton, Glenn Close, and Paddy Considine. Tipper plays Devani, a soldier living through the zombie apocalypse, who is witness to the monitoring of and experimentation on a group of highly intelligent, but feral, children. As well as appearing in Mark Waters’ adaptation, of Richelle Mead’s young adult novel Vampire Academy (2014), in 2012, Tipper starred as Sarah in Fast Girls, alongside Lenora Crichlow, Lily James, Noel Clarke, and Bradley James. Co-written by Noel Clarke, Fast Girls depicts the rivalry between young athletes Shania Andrews (Crichlow) and Lisa Temple (James) as they compete to become professional sprinters. In addition to acting Tipper took her first steps into directing and producing in 2018 with the creation of “Trying To Find Me” her first short film based on the one woman play of the same name, written and performed by Ann Akin. She is currently developing her first feature film.